Both my brother and I were in town. We started playing EDH at the same time a few summers ago, and mostly played 2 player games. He brought all of his cards home except his decks, so I let him borrow one of mine. We added in Planechase to make the game more interesting. I picked Rhys in his honor (since it’s his middle name… also it’s pronounced like “Reese/Reece” not “Riss/Rizz/Rice/Ryes”), he picked Sygg for an Elves vs. Fish battle. We started on Gavony. I kept a 1 land hand, but was able to draw into lands to play an Elvish Arch Druid. He dropped a Reliquary tower, and was able to get Sygg on board on turn 3, and play a Harpoon Sniper. His Mirrorweave had unsuspended at this point and suddenly we all had 12/12+ Heedless One’s. He swung, but I was able to absorb the attack, and follow up with the kill the next turn. Had he realized how Umbral Mantle worked, he might have had me with Generals damage earlier (I was up to 16). 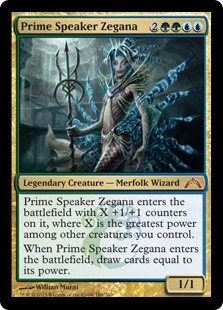 Having aborted the previous game (and engaged in conversation where Savra and I attempted to explain that the Azami deck was not “degenerate” it was just not fun to watch), we welcomed Obzedat (a new deck from a regular player) to the table and started again. I started out with a pretty rad beginning, Mirri’s Guile and then Azusa, and I built up to eventually having Oracle of Muldaya, Phyrexian Arena and many lands on the table. Obzedat come down early and started picking away at life totals, and Trostani had a Skull Clam get destroyed by Savra’s Vraska, which came down after a slow 1-land, Birds of Paradise and Elves of Deep Shadow beginning. I was establishing a pretty strong board position, and Obzedat and Trostani were gaining a lot of life. Savra had established some sac-outlets, including Varolz, the Scar-striped. I used Sisters to wipe Savra’s board and steal an Ogre Slumlord and Trostni Responded by casting Phyrexian Rebirth. This wiped the board of my Oracle and Azusa, as well as my Creakwood Liege, but left me several rat tokens to keep the Gaea’s Cradle that I grabbed with Realms Uncharted (that put an Urborg and Petrified Field in the ‘yard), and I felt like I was pretty set. 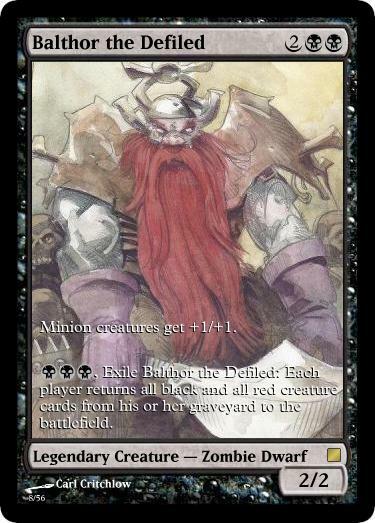 Obzedat just kept picking away at life totals via the General and a Buyback life-drain spell. I top-decked a Crucible of Worlds, got back Urborg, which, along with a Cradle and a Cabal Coffers, meant I had tons of mana. I had a lot of snake tokens from an Orochi Hatchery, but no Snake Lords to pump them up, so attacking or doing damage was a struggle. The Nu-Ravnican generals were both quite high in life. I Beseeched the Queen for Ob-Nixilis, the Fallen, and then used my remaining rat tokens for Perilous Forays, emptying my deck of basic land, and taking a chunk of life from the two high-life-total players. Savra was having trouble rebuilding. All the while I’m being pounded down in life from the Phyrexian Altar and big Trostani Tokens, dropping down to about 8 by the end. Sisters cleared the way for a 30+/30+ Ob-Nixilis and a 20+/20+ Geist Honored Monk (stolen from Trostani) to pound out Obzedat. Trostani played a Phyrexian Altar, dropped his life down to 1 (from the 40s), hoping to make a token and populate it and gain a ton of life. 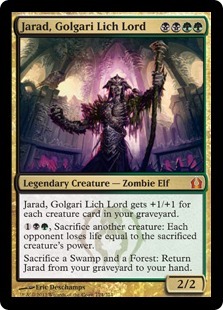 Savra used Jarad to sacrifice a 3/3 and end Trostani’s last-ditch effort. Without enough mana to activate Jarad again, I untap and am able to swing for the win. It was a long game, and there were a lot of challenges. I had a pretty solid and unchallenged board position throughout, but dealing with that many lands/that much mana is really too much record keeping and card management, so I ended up struggling a bit to enjoy the victory. This deck started out with the intention to be two decks: one a mono-green snake tribal deck, and the other a BG Landfall deck. Eventually they merged into a single deck, since the Kamigawa snakes play well with lands, and Sisters of the Stone Death are really fun if you have enough mana to make them matter. Also Gorgons have snakes for hair, so all of the Orochi can be “Hair”. And Lotus Cobra is a thing. It’s not strictly tribal, as it contains land-friendly human wizards and elvish shaman, some worm tokens, and a pretty angry demon, but it still plays a lot of snakes just because they’re snakes. This was the only deck that I own that was significantly affected by the Banning of Primeval Titan (which was replaced by Boundless Realms). There are a lot of cool new lands that I could consider adding, but I find this kind of ramp deck gets tedious to play and mana-manage, so, while I like the deck and the commander, I don’t play it all that often. Having just come off the most fun game thus far, I was pretty psyched to play this game, even if it meant playing against Grixis Combo (if the General has only been cast once in the deck’s existence, it doesn’t get to be the deck anymore), and I have a pretty decent starting hand with 2 forests a Scute Mob, a Slitherhead and a Bond Beetle. I lucked into a Swamp on the 3rd turn, and was psyched to get Dornenschädel rolling with an extra +1/+1 counter to start with, but Combo looks over, ponders for a moment as I’m about to tap mana for a second spell and says “Spell Crumple.” That was pretty much the end of my fun. All I had were two 1/1s, which for the next several turns (where I wasn’t drawing lands) I just swung at Combo with my tiny guys out of spite (even when Savra, who had a really buff board position, was tapped out). Eventually I got a 4th mana and cast a Forgotten Ancient. Zeganna (who was Olivia in the previous game) had a bunch of evolve stuff AND a Cloud of Faeries AND a Deadeye Navigator. 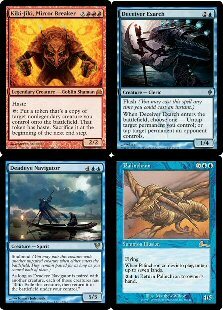 I considered shipping 8 or so counters to his Fathom Mage. I eventually got a Carrion Feeder with a Sadistic Glee up to 9/9, and took care of Combo’s Consecrated Sphinx with a Vraska, the Unseen (the turn after Combo countered Savra’s Vraska, the Un, Seen, but then a Deadeye/Palinchron was dropped, infinite blue mana was made, and Combo said… “now I have infinite mana, but I can’t win this turn… ha ha. Lighthouse Chronologist, Level Up 8 billion times.” And that was it for me. I packed up my cards while the Chronologist was explained to Zeganna, who then said “Hey, want to play a different game?” Another player had arrived, and there was only 45 minutes left, which isn’t enough for a 5 player game (Combo said, there’s time if we all try to play fast and play fast decks… I laughed inside of my head). I ended the evening learning how to play some sort of Greek-vs.-Norse-Gods-but-they’re-all-scantily-clad-anime-chicks game, that was actually pretty fun. I don’t know if we played it right, but I guess I won. This one’s pretty simple. Turn Skullbriar sideways and pump him up. Plenty of sac-outlets so he doesn’t get bounced or tucked, and plenty of graveyard recursion so that he can go to the ‘yard instead of the command zone. There are a few other +1/+1 counter tricks. I can’t remember if the Devoted Druid/Quillspike combo is in the deck currently (despite what it might seem like, I’m not anti-combo… just anti “I will combo out in one of two ways every single game”). Despite the soul crushing un-fun of the previous week, I went in to this Wednesday ready to have a good time. I got to the store early and there was one other player already there. Luckily it was my favorite opponent. Since he has only 2 decks, I think of him as the opposite end of the spectrum from me. I had Jarad slated as my first Guild deck, and I decided to play it in a Guild Wars Battle for Guild Dominance. I knew my opponent’s deck was better than mine, but I also knew it would be a good game. I kept a 5-land hand that also had a Sisters of the Stone Death in it. 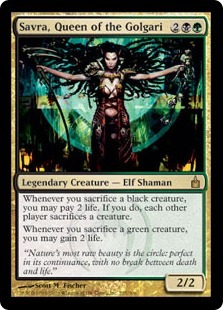 Savra started out with an early Thoughtpicker Witch and soon had a pretty large Golgari Grave Troll as well. I took care of those with an Abrupt Decay and a Putrefy (thanks, no regeneration clause). Somehow we cleared off the board (I know I had a Golgari Rotwurm in there) and had dueling Thugs. Savra got back the Thoughtpicker and had out a Death’s Presence, which was pumping Savra. It was a slow, grindy game, but eventially it came down to the two Generals, other people had arrived, so we tried to hurry the game along and Savra was able to attack for enough General Damage, of all things, to kill me off. This is the first of 10 Guild decks that I built, limited to cards from both Ravnica blocks, provided they are Golgari watermarked, or non-watermarked. There’s not much to say about it, other than I am much less skilled at playing Dredge than the Savra Guild-deck player.